House Martin Island in Somerford Keynes, near Cirencester, Gloucestershire sleeps 6 people. House Martin Island near Cirencester is a detached property enjoying access to a spa with swimming pools, sauna and a steam room, a wonderful relaxing getaway. 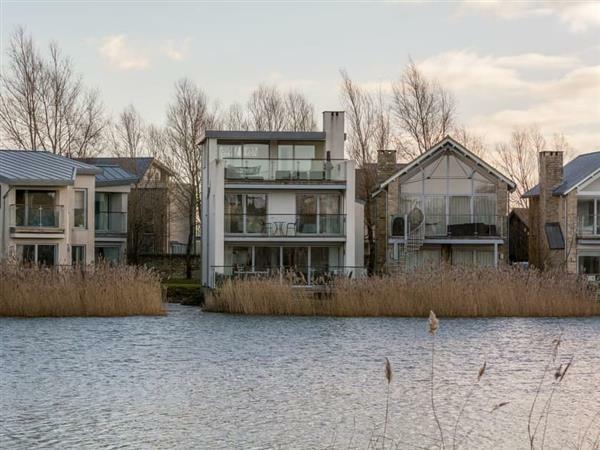 Situated on its own small island, the three terraces overlooking Howells Mere Lake are a fabulous feature and are designed for al fresco dining. The property has been furnished to a high quality with exceptional interior design, making it perfect for entertaining. The Lower Mill Estate in Somerford Keynes is a development of stunning, contemporary homes situated on a private 450-acre nature reserve. The gated and managed estate comprises of woodland and meadows crossed by three rivers and is surrounded by serene lakes. In addition to the house’s facilities, guests can enjoy the estate’s ArtSpa comprising indoor and outdoor heated pools, an eco-pool, sauna, steam room, gym and treatments by arrangement. On the estate there is a tennis court, nature trails and cycle tracks, a playground, equipment hire and licensed restaurant with farm shop. There is a shop and restaurant 350 yards from House Martin Island near Cirencester, with the pub 1 mile from House Martin Island. Bedroom 1: With double bed, door leading to balcony, and en-suite with shower cubicle and toilet. Bedroom 3: With super king-size bed and en-suite with shower cubicle and toilet. Gas central heating, gas, electricity, bed linen, towels and Wi-Fi included. Logs for wood burner available locally. Travel cot and highchair. Welcome pack. Enclosed terrace. 3 enclosed balconies with sitting-out areas. Grounds (shared with other properties on-site). Spa with gym, indoor swimming pool and outdoor swimming pool with shower facilities, changing facilities, spa bath, steam room and sauna. Tennis court and children’s play area (shared with other properties on-site). Private parking for 1 car; additional on-site parking. No smoking. Please note: Couples and family bookings only. There are lakes in the grounds. Holidays at House Martin Island run from Friday to Friday. For a better idea of where House Martin Island is, you can see House Martin Island on the map below. House Martin Island is in Gloucestershire; should you be on the lookout for a special offer, you can find all the special offers in Gloucestershire. It's always worth checking to see what is on offer at the moment. Do you want to holiday near House Martin Island (UK10688), you can see other cottages within 25 miles of House Martin Island; have a look to find your perfect holiday location.